Green Boost Green Superfood Powder is a powdered blend of nutrient rich superfoods, clinically proven to carry a wide range of benefits to overall health and vitality. This supplement provides a quick and easy injection of goodness into your daily diet. It is also convenient to administer in powder form, either sprinkled onto your food, tea/coffee or put into easy to digest shakes. A powerful blend of fruits, vegetables & antioxidants in one convenient blend for optimum health & nutrition. Simply add one level scoop to 200ml of fruit juice or water. Can also be mixed into soups and smoothies for an extra nutrition boost. Contains Spirulina, Alfalfa, Wheat Grass, Spinach, Green Tea , Broccoli and a lot more. 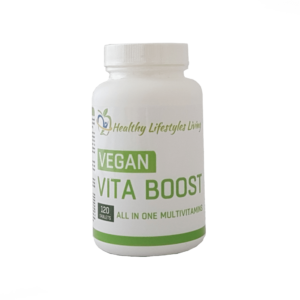 Dairy free and Suitable for vegetarians and vegans. 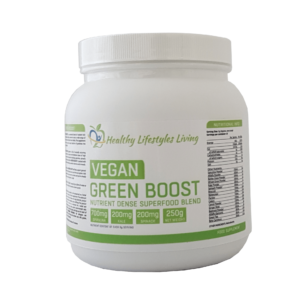 Greens Boost superfood powder is a high strength, complete super green food supplement with 17 natural ingredients. A powerful blend of 17 delicious natural vegetables & antioxidants in one convenient blend for optimum health & nutrition. Perfect for adding to smoothies, juices and foods to help increase your intake of fruit and vegetables. 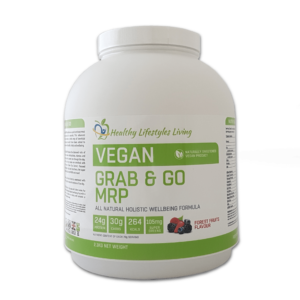 This vegan food supplement can be used daily, and each tub contains approximately 50 servings. It is Vegetarian, Vegan, Dairy Free. Greens Boost powder is full of naturally occurring goodness and is packed with effective doses of high value natural compounds including spirulina, spinach, barley, broccoli and kale. Greens Boost is packed with powerful antioxidants, essential vitamins and minerals. A daily dose of Greens Boost will help support general health and vitality and boost your immune system. 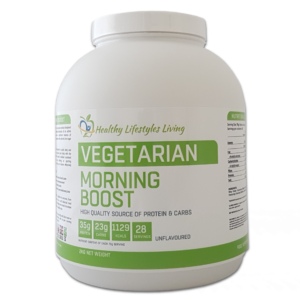 Add a spoonful into your morning shake and you’re already well on your way to your 5 a day! Greens Boost works to deliver vital nutrition, without any harmful fats, sugar, artificial flavours or colouring. It works to trap the cholesterol and remove it from the body. You are of course advised to research the product thoroughly in order to determine whether you are allergic to any of the active ingredients. The product is however comprised of natural ingredients and is subsequently free of any known side effects. Spirulina, described as the ‘world’s richest source of non meat protein, is a superfood with incredible health benefits! A complete protein, this blue-green algae provides an ideal balance of all nine essential amino acids. It’s also loaded with vitamins A through E, iron, potassium, calcium, and antioxidants’. Alfalfa a unique complete food was once referred as the “Father of all foods”. Scientific studies show that alfalfa contains almost all the known vitamins, minerals and trace elements needed for premium health. Barley grass powder has many nutritional benefits being a whole food offering balanced nutrition to the body with its alkalizing contents. It’s packed with a concentrated source of nearly three dozen vitamins and minerals, including vitamins A, C, B1, B2, Folic Acid, and B12. Barley grass powder is also packed with chlorophyll, which aids in restoring and replenishing blood cells. Wheatgrass, the sprouted shoot of wheat powder, is one of the most potent leafy green powders, packed with beta-carotene, calcium, chlorophyll, fiber, iron and vitamin K.
Kale Powder called the queen of greens, is loaded with vitamins A, C & K, calcium, carotenoids, and cruciferous compounds provides the body with essential nutrients vital for good health. Spinach powder is a good source of protein, vitamins A, C, and K, calcium, iron and other nutrients. Broccoli packs the most nutritional punch of any vegetable including vitamin C, vitamin A (mostly as beta-carotene), folic acid, calcium, and fiber. Broccoli is an important calcium source for those who don’t consume dairy products. Watercress is an antioxidant rich, low-calorific, low-fat vegetable and is a storehouse of many natural phytonutrients like isothiocyanates that have health promotional and disease prevention properties. Parsley is a low calorific herb recognized as one of the functional food rich in antioxidants, vitamins, minerals, and dietary fiber. Parsley contains health benefiting essential volatile oils that include myristicin, limonene, eugenol, and α-thujene. Celery contains useful phytonutrients, vitamins and minerals with potential benefits of lowering inflammation and blood pressure, reducing the risk of cancer, and preventing age-related degeneration of vision. Carrot powder, a goldmine of nutrients, rich in beta-carotene, which converts to vitamin A in the body. Ginger root is a powerful anti-inflammatory herb as well as having carminative, anti-flatulent, and anti-microbial properties. It contains health benefiting essential oils such as gingerol, zingerone, shogaol, farnesene, and small amounts of ß-phelladrene, cineol, and citral. Beetroot is a good source of soluble fibre that may provide special health benefits particularly with respect to health of the digestive tract and cardiovascular system helping to lower LDL cholesterol, a natural source of nitrates which may assist blood pressure, plus a very good source of manganese, potassium, and copper. Alfalfa sprouts are the shoots of the alfalfa plant, harvested before they become the full-grown plant that contain a concentrated amount of vitamins and minerals such as calcium, vitamin K and vitamin C.
Green tea has special health-giving properties and is renowned for its antioxidants and health benefits. Beta Carotene β-Carotene is an organic, strongly colored red-orange pigment abundant in plants and fruits and is an antioxidant.